Oral hygiene is an important aspect of all of our lives. Dentists recommend that we brush our teeth at least two or three times each day. One way to take the initiative in preventing gum disease and cavities is to use a toothbrush that will not only brush your teeth, but remove the tartar buildup on your teeth at a faster more efficient pace than standard toothbrushes. An electric toothbrush is typically a bit smaller than a manual one, so it is easier to clean all the hard to reach places in the back of your mouth. Before you start looking for a new toothbrush, it is important to know the features that will benefit the health of your teeth and gums the most. 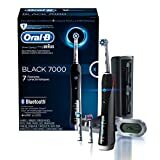 We have comprised a list of three of the best electric toothbrushes available as well as a budget friendly pick. A typical gold pick on our list means that the product is loved by critics and consumers alike, DiamondClean, which is a Philips Sonicare product, is no different. This electric toothbrush features a design that is dentist approved to get your teeth as clean as possible. The diamond shaped bristles are a medium stiffness, which is great for getting into all of those hard to reach spots. The design allows you to use a gentle sweeping motion to move the brush while the electronic aspect of the device does all of the work. This toothbrush is also the perfect solution for getting between your teeth and close to the gums as you brush. The DiamondClean operates at 31,000 brush strokes each minute to remove plaque at least five times more efficiently than a manual toothbrush. This electric toothbrush features an ergonomic handle design that is comfortable to grasp and it has a non-slip surface that you can even grip with wet hands. The DiamondClean comes with two brush head attachments; one is the standard attachment and the other is a more compact version that is convenient for travel. There is also a convenient little travel case that can carry your toothbrush and the brush heads easily in a secure location. The best thing about the travel case is that it actually doubles as a charger. While your toothbrush is packed away, simply connect it to a USB wire and let it charge. To make the charging process simpler, a USB wire and a wall plug is also included when you purchase this electronic toothbrush. There are also two other methods that you can use to recharge the batteries in this toothbrush. One is to use the standard base that allows you to place the toothbrush in an upright position as it charges. The other option is a charging glass, which is a great way to charge your toothbrush in a more secure way. It will prevent your toothbrush from being knocked over, and if there was any excess water left on the toothbrush, it can be collected and washed from the cup rather than ending up all over the bathroom sink. Once the toothbrush is fully charged, you will be able to use it approximately 42 times before the batteries begin to lose their charge again. That means that you will be able to use you toothbrush for more than three weeks on one charge. This toothbrush has five different brushing modes to help you get the cleanest, whitest smile possible. The first is clean, which simply gives you two minutes to thoroughly brush your teeth. The second mode is white, which gives you a full two minutes to remove stains from your teeth, and then another 30 seconds to brighten and polish them. There is also a polish mode that is used to simply add brightness to your smile. Gum care mode gives you two minutes to brush and clean your teeth as well as extra time to massage and stimulate your gums. The last mode is a sensitive mode that is used to gently clean your gums and teeth, which is especially useful if your gums are irritated. When you first switch to the DiamondClean, there is an option to use the easy start program, which is designed to ease you into this type of brushing. The first 14 times you brush your teeth with this toothbrush, you will receive a less intense brushing session, which is designed to prevent irritation from occurring along your gum line. The DiamondClean also has two separate timers that you can utilize as you brush. One is a simple two minute timer to ensure you brush long enough, and the other one is a quadpacer, which is a 30 second interval timer that helps you spend enough time in each area of your mouth. Another feature that is great to have, is the fact that the blue bristles fade as you use this toothbrush, and when they become white, you know that it is time to replace the brush head. This product is heavily backed by the manufacturer; in fact, they promise that you will have whiter teeth within one week. They also promise that with regular brushing your gum health will improve within two weeks. If your next dental check up does not show an improvement from your last visit, then you can get all of your money back. 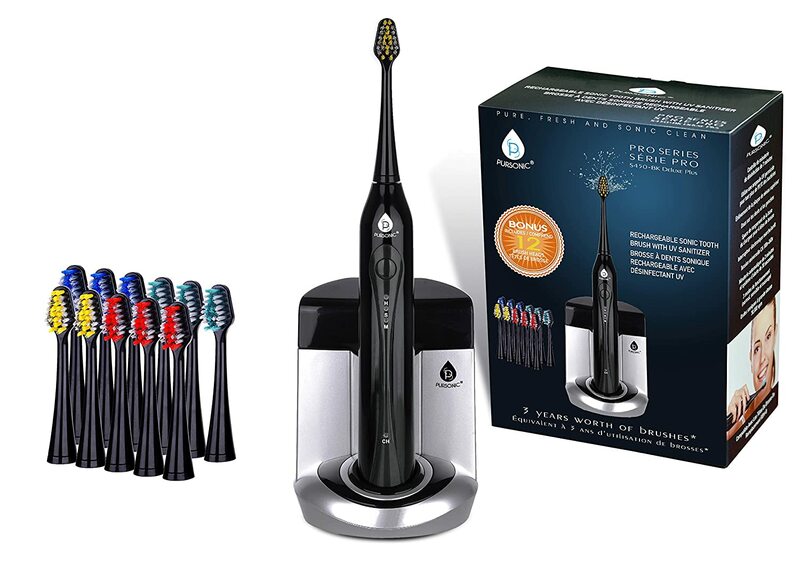 There is also a two year warranty included with the purchase of this electronic toothbrush. In addition, you can purchase this toothbrush in four different colors, which means that your toothbrush can match your style, personality, or bathroom décor. You can choose from black, white, pink, or amethyst. Insofar as reviews, the DiamondClean is loved by dentist, patients, and critics alike. 84 percent of the 2,312 reviews on Amazon were positive, which means that they received a rating of at least four stars. Many of the reviewers love the clean feeling that they experience after brushing their teeth with this toothbrush; in fact, many describe the feeling like having your teeth freshly cleaned at the dentist office. It is simply a great tool to use when brushing your teeth, and this five star testimonial could not state it better: “Best toothbrush I’ve ever had! The head is small enough to really get my back teeth clean. I also love that this has a sensitive setting on it.” The only issue that consumers had with the DiamondClean is that it is a bit on the more expensive side, but this is a toothbrush that you will never need to buy again. Simply purchase new brush heads when the need arises. Oral B is the number one brand recommended by dentists across the world, so it should come as no surprise that one of the top picks on our list spawns from that company. The Pro 7000 SmartSeries comes with a sleek black design that is fitted with an ergonomic rubber handle to help you keep a good grip on a wet toothbrush. This toothbrush is a durable device that cleans your teeth two times better than a typical manual toothbrush. It is capable of pulsation 40,000 times each minute as well as oscillating 8,800 times. 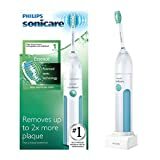 This toothbrush features 3D cleaning technology, which uses rotating motions, oscillating motions, and pulsing motions to give you the deepest possible clean. Using all of these types of cleaning styles at once assures that you will never miss a spot when brushing your teeth. There is also a timer to make sure that you are brushing at least the two minutes that most dentists recommend. If you prefer to time each section of your mouth, there is also an interval timer available on this device. After 30 seconds have passed, the toothbrush will inform you to move to the next area of your mouth by flashing green. A small beep can also be heard as well as a pulse that can be felt from the handle. There are six different cleaning mode options on this device. There is a daily cleaning mode for brushing on a daily basis. A deep clean mode for when you need to remove stains from your teeth as well as a whitening mode to follow up afterwards. There is a massage mode that is great for your gums, and a sensitive mode for those with extra sensitive teeth. The final mode gives attention to your tongue, which is an area that is often ignored. The Pro 7000 also has a pressure indicator to let you know when you are brushing too hard, which will be indicated with a red light. In addition, if you are using the Smart Guide, the smiley face that appears will be frowning at you. The Smart guide is a function of this toothbrush that assists you with your daily brushing routine. It times your sessions, and when you complete two minutes of brushing a smiley face will appear. This device can be stuck to the mirror while you are brushing or it can be left on the counter to serve as a digital clock when you are not brushing. If you prefer something more detailed, this toothbrush is Bluetooth compatible to connect to an Oral B application that you can download on your phone. It is designed to give you real time feedback on your brushing habits and help you develop better brushing habits, but it is a bit unrealistic to be required to take your phone into the bathroom with you every time you brush your teeth, especially when you can simply use the Smart Guide. Another reason to utilize the Smart guide is that it can be synced to two different toothbrushes at once. This toothbrush comes with three different brush heads. The floss action head is designed to get the hard to reach areas between your teeth. The pro white brush head is designed for stain removal and teeth whitening, and the sensitive brush head is pretty self explanatory. Most of the other Oral B brush heads are also compatible with the Pro 7000. An added feature of these brush heads is the fact that they all have blue indicator bristles that fade after three months of use. 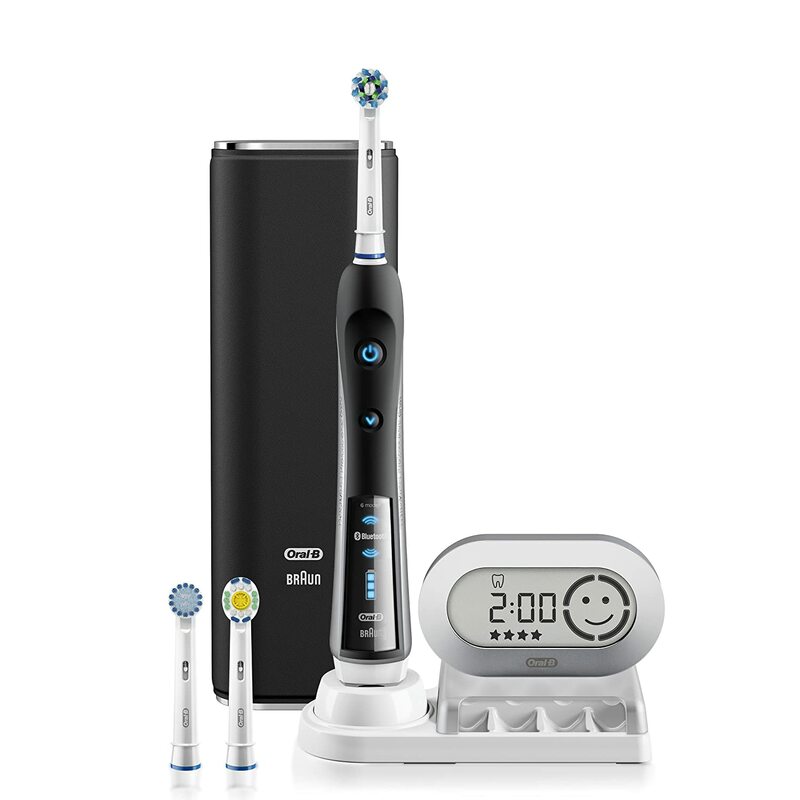 The Pro 700 is a great electronic toothbrush for travelers, since a single charge will last at least ten days. The charging station holds one Pro 7000 handle as well as four extra brush heads. The Smart Guide device can also be attached to this base if you desire. In addition, when you decide to purchase the Pro 7000, it comes with a nice carrying case that holds the handle and two brush heads. The case can easily be attached to the charging station, in case you want to keep everything in the same area on the sink. In addition, the Pro 7000 also comes with a two year warranty that is backed by the manufacturer. Another company that is known for manufacturing products related to dental hygiene is Pursonic. The S450 Deluxe is a toothbrush that falls in a slightly lower price range than the others on our list, but it keeps a lot of the features that you want to have on an electronic toothbrush. First, it has an ergonomic design that is easy to hold and will not slip out of your grip if your hand is wet. This electric toothbrush is designed to complete 31,000 strokes each minute, each of which are able to reach all of the hard to reach areas that are hidden in the back of your mouth. To help you brush more effectively, there is a two minute timer that assures that you will brush for the full two minutes that most dentists recommend. There is also an interval timer that will beep every thirty seconds. This indicator is a great way to make sure that each part of your mouth gets the attention it deserves. Start with the left top quadrant and go clockwise around your mouth every time the 30 second timer is up. A feature that many other electric toothbrushes fail to incorporate into their toothbrush base is a UV sanitizer. This feature is located directly on the charging base, and it is designed to kill 99.9 percent of the germs and bacteria that can be found on your toothbrush head. You simply need to place your brush head in the designated container, which contains a germicidal UV bulb that will sanitize your toothbrush in about seven minutes. If you want to sanitize the entire family’s toothbrush heads, the sanitizing chamber can hold up o four toothbrush heads at one time. This toothbrush has three different modes that you can use to clean plaque from your teeth and gums and naturally whiten your teeth. These modes are a normal cleaning mode, a soft gentle mode that is designed for sensitive teeth, and a massage mode that is mainly designed to clean and massage your gums. If you purchase this electric toothbrush, you will find that 12 additional brush heads are included with your purchase. They come in assorted bristle colors so that each member of the family can use a different color and know which brush head is theirs. The brush heads are easy to remove and replace, so you will never have to have more than one toothbrush base per household. If you are only purchasing this toothbrush for yourself, then you just scored enough toothbrush heads to last you three years. That estimate is based on dentist recommendations to change your toothbrush very three months. This toothbrush is available on Amazon in a few different color options, which are black, red, blue, and silver. The bristles of the additional brush heads are blue, green, red, and yellow, so that is four distinct colors, which is perfect for a family of four. When you decide to purchase the S450 Deluxe there is also a one year warranty included incase anything happens to the toothbrush that you purchased. 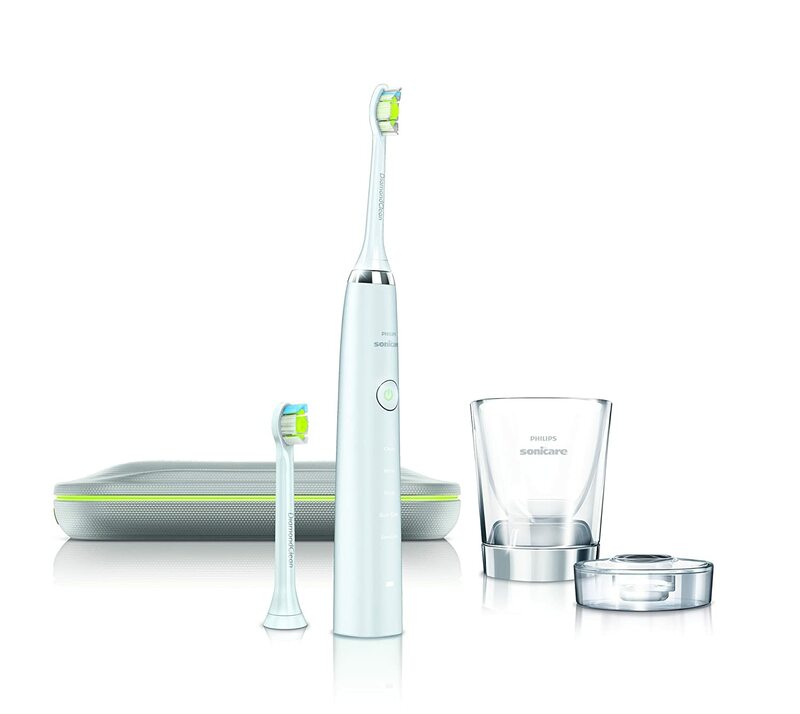 Philips Sonicare once again shows up on our list, and this time it is the Essence that graces us with its presence. The company realizes that not everyone who wishes to purchase an electric toothbrush can shell out the kind of money that is required to purchase our gold pick, so they have designed other high quality options that those who are ballin’ on a budget can afford as well. The essence features an angled neck design that makes it easy to brush all of the places in the back of your mouth that are hard to reach. It also has soft contoured bristles that are designed to clean every aspect of your teeth and gums. This toothbrush utilizes a gentle sonic technology that creates a sweeping motion that will move 31,000 times each minute. This method of brushing is capable of removing twice as much plaque and bacteria as a manual toothbrush, which is a great way to naturally whiten your teeth. Since this brush is designed to be a no frills device, it only has one type of timer. It features a simple two minute timer that will let you know when you have brushed your teeth as long as most dentists recommend. There is no interval timer, so if you want to time how long you brush each area of your mouth, this may not be the toothbrush for you. There is an easy start mode available for when you first use the toothbrush. The manufacturer is aware that it takes time to get use to a new toothbrush, so for the first 12 times you use this toothbrush; the movements of the brush will use a little less brushing force than normal. After about a week, you can expect normal brushing pressure and rotation. The brush heads on this toothbrush screw in, so there is a chance that saliva and toothpaste will find their way into the nooks and crannies of the device. The imperfect seal can cause the toothpaste to cake around the area, which means that you will need to make sure to thoroughly rinse the toothbrush after every use to prevent this from occurring. The brush heads use blue and green bristles that also serve as an indicator to let you know when you need to change them out for new brush heads. Most dentists recommend only using a toothbrush for 90 days, so makes sure to pay attention to this indicator to have the cleanest mouth possible. There is also a low battery indicator to let you know when the battery is low. The battery in this device is a Ni-MZ, which typically lasts for about two weeks on a single charge, but when the battery life is dwindling, that indicator light can make sure that you can brush your teeth before you go to bed that night. A convenient travel case is also included with the purchase of this toothbrush. • Rotating – These types of toothbrushes use a circular motion that is similar to a manual toothbrush pattern. On this type of toothbrush, the bristles can either rotate together as one unit or separately. • Rotating/Oscillating – With this type, the bristles rotate and pulse in a way that is designed to efficiently fight plaque. The entire brush head rotates and is able to focus on cleaning one tooth at a time. • Counter Oscillating – This type of brush head rotates and oscillates as well, but each individual bristle moves in the opposite direction of the bristle next to it. This motion ensures that the whole tooth gets brushed. • Dual Head – This type of electric toothbrush utilizes the rotating motion of the previous types as well as a back and forth motion. It is designed to clean your teeth more thoroughly, but since this style is a bit larger than many other electric toothbrushes, it may make it more difficult to brush all of those hard to reach areas in the back of your mouth. • Vibrating – This type of toothbrush simply vibrates against your teeth as you brush to help you loosen and break up plaque before you brush it away. The speed that your toothbrush oscillates or rotates effects the time it takes to clean your teeth. The faster the brush can remove the plaque, the more efficient two minutes of brushing will become. If you are looking for a faster toothbrush, then look for one with sonic or ultrasonic in their name. Dentists recommend brushing your teeth for at least two minutes to get a fully refreshing clean, but many of us tend to rush through this routine. Some electric toothbrushes have timers that automatically turn off the toothbrush when two minutes have passed. There are also more complex electric toothbrush timers available. These types of timers give you an indication every thirty seconds to let you know that you should move on to cleaning the next area of your mouth. When you use these types of timers you often divide your mouth into four areas to make sure each area gets cleaned within the two minutes that it should take you to brush your teeth. Some toothbrushes let you choose between different modes and functionality. For instance, if you have sensitive gums, then it is important to utilize sensitive mode, to make sure over brushing does not irritate you gums more. There is also the possibility of a massage mode, and a deep cleaning mode to get a more stimulating brushing experience. You can also consider whitening mode if you feel that your smile is not as bright as it could be. You need to brush your teeth well, but not hard. Extra unnecessary pressure can cause your gums to be irritated and bleed, which can eventually lead to gum recession. To prevent you from causing damage to your gums and applying extra pressure while you are brushing, some manufacturers have added a feature that warns you when you are using too much force. Often this warning comes in the form of a beep or a flash. Other indicators that you may desire in an electric toothbrush may be a charging indicator that lets you know that the battery level in your toothbrush is low. In addition, some toothbrush heads are designed so that the bristles fade or change color when it is time to replace it. This is a great tool to have, especially if you tend to forget to replace your toothbrush at least once a year. When buying a new electric toothbrush, you want to make sure that it accommodates the type of brush head you use. There are many different types of brush heads, each of which clean using different methods, so make sure that you can interchange the brush heads to get different areas of your mouth. Also, some electric toothbrushes do not allow you to change the brush heads at all, so make sure that is a feature that you consider before purchasing one that you will be stuck with. Power is required for any electric toothbrush, but which source of power do you prefer? Electric toothbrushes typically utilize batteries instead of plugging directly into the wall right next to the sink. So the question is: should you use regular batteries or rechargeable ones? Alkaline batteries may seem like the cheaper option, but they will need to be replaced on a regular basis, which can have an impact on not only your wallet in the long run, but the environment as well. Choosing a rechargeable option allows you to use an AC adapter to recharge and reuse the batteries, which means that you will not need to purchase new batteries as often. An electric toothbrush can greatly improve a person’s oral hygiene, so it is important to know which modeel has all the features that make this daily routine a simpler process that does all of the work for you. If you are considering buying, you are faced with a number of decisions that will sway your thinking and help you decide which electric toothbrush you are going to purchase. You need to decide if you want to time your brushing habits or if you want a device that can monitor you brushing habits to make them more effective, which will give you a cleaner feeling mouth and whiter teeth. The decision is yours, but hopefully this guide has helped along the way. Compare your needs to our top picks, and decide which electric toothbrush will give you the oral hygiene you need to show off a healthy, white smile.